Mildura Plaza Motor Inn is the best location for you to spend your holiday in the Mildura & Sunraysia region. We are right across the road from Mildura Centro Plaza with its Food Court, Specialty Shops, Cafes, Target, Woolworths and more. Plus the Mildura Gateway Tavern is only 5 minutes walk away. They have a great family bistro, gaming lounge, sports bar, and bottle shop. Hudacks Bakery is right next door - open for breakfast and all day for coffee, cakes, pies, sandwiches, salads, fresh bread - including the famous Mildura Orange Bread. Corporate Guests: Requiring a good bed, rest & relaxation in a quiet room after a busy day and access to easy dining and recharge. Families: Needing space, enjoyment & good sleeping arrangements. Great access to family dining. Couples: Looking for a quiet retreat or maybe the enjoyment relaxing in one of our deluxe spa units, followed by good wine and a fine restaurant. Seniors: A nice bright comfortable room, a couch for reading and relaxing, a wonderful bed after a tiring drive or a busy day sightseeing. 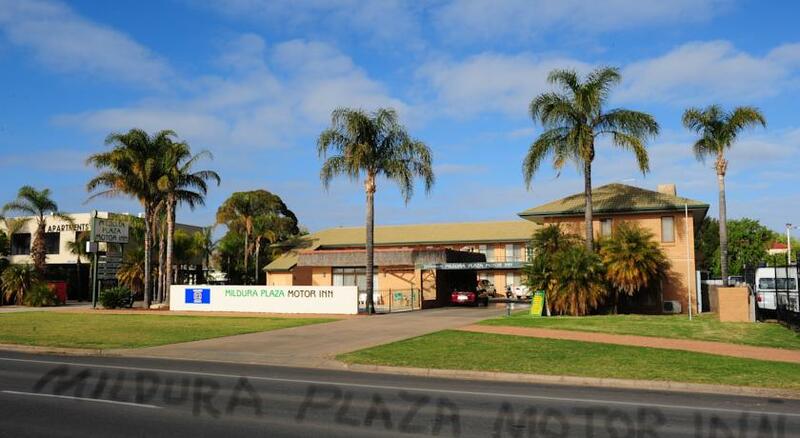 At Mildura Plaza Motor Inn, you will find ample safe off-street car parking. If you have a boat trailer or large vehicle we can assist you with your parking needs. No messy tight or difficult situations, we will do our best to have your car situated as conveniently as possible.